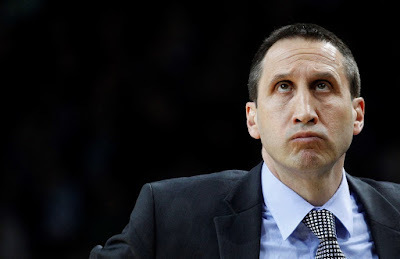 In an unexpected turn of events, the Cleveland Cavaliers fired head coach David Blatt in the middle of his second season. He was replaced by assistant Tyronn Lue, who will in Blatt's place lead the Eastern Conference at the All-Star Game. The move sent shock waves through the league, especially since the Israeli-American coach had guided Cleveland to the Finals last year and the Cavs had the best record (30-11) in the Eastern Conference this year. According to "sources", many Cavs players felt that Blatt was in over his head. LeBron James responded that he has "never undermined a coach" following accusations of being a coach killer. Former Hawks highflyer Josh Smith, who had latched on with the Clippers over the summer, was traded back to Houston, where he spent 55 games last season after being waived by Detroit. It was no secret that Smith, who averaged 5.7 PPG on .383 FG% in Los Angeles, wasn't a good fit, reportedly even beefing with assistant coach Mike Woodson. The Clippers receive the draft rights to Maarty Leunen, who currently plays in Italy. Now back with the Rockets, Smith will try to give James Harden and childhood pal Dwight Howard some support from the bench. Lakers guard Kobe Bryant, who in November announced his retirement, will not be playing in the 2016 Summer Games in Rio. His final game will be April 13 against the Utah Jazz. Having won gold medals in 2008 and 2012, he says that "It's the young guys' turn to go and play an perform." Bulls big man Joakim Noah is likely out for the rest of the season, which means that he could have played his last game for Chicago. Following a late-December shoulder strain, Noah opted for surgery on his left shoulder, effectively sidelining him for 4-6 months. The 2014 DPOY was averging 4.8 PPG and 8.8 RPG in the final year of the 5-year, $60 million contract he signed in 2010. Clippers forward Blake Griffin was involved in a physical altercation that left him with a broken hand. He reportedly got into an argument with Matias Testi, the team's assistant equipment manager, at a restaurant during the team's trip to Toronto. Griffin had already been sidelined since December 26 with a partly torn tendon. There is some chatter going around that perhaps the Clippers should trade Blake Griffin, since he would probably net the most, and build for the future with Chris Paul and DeAndre Jordan. The Golden State Warriors are currently 44-4. After 48 games, the 1995-1996 Bulls were 43-5. Follow Golden State's chase here. According to league boss Adam Silver, the NBA is not seeking to add a European franchise in the near future. Stephen Curry, Russell Westbrook, Kobe Bryant, Kevin Durant and Kawhi Leonard were chosen to represent the Western Conference, with Kyle Lowry, Dwyane Wade, Carmelo Anthony, Paul George and LeBron James selected as their Eastern Conference counterparts. Reserves Draymond Green, James Harden, Chris Paul, Klay Thompson, Anthony Davis, DeMarcus Cousins and LaMarcus Aldridge round out the Western Conference roster, Jimmy Butler, DeMar DeRozan, Paul Millsap, Andre Drummond, Chris Bosh, John Wall and Isaiah Thomas do the same for the Eastern Conference.